Having dosa batter in the fridge is like having ready drafts of posts in your folder which you could post as and when you are busy.Easy and stress free.I was fascinated by ready-made dosa batter available in Chennai when I first came here.It used to be such an easy thing to stock up and make dosa/idli whenever we fancied having it. But once I started making dosa batter on my own,I have not purchased those.One thing is hygiene.I happened to pass through a 'mavu mill'[wet and dry flour mill]on a roadside and the sight I saw there was pathetic and I vowed never to buy ready-made batter again. Only problem with making homemade batter is the amount it yields.Between two of us,the batter lasts us for almost a week.So to prevent the batter from getting sour I have to make dosas every alternate day[if not daily].I do have some ulterior motives here as I am a big dosa lover. Kanchipuram dosa* is a small variation from the plain dosa which definitely brings some variety for dosa on the breakfast table.Dosa batter,potato-onion masala and kanchipuram masala is all you need to make a dosa which looks quite gourmet and tastes equally so! In a pan add ghee and saute all the ingredients for the Kanchipuram masala for 5-7 minutes.Add a pinch of salt and coriander leaves and switch off the flame. Heat a dosa pan and lightly smear with oil. Pour a ladleful of dosa batter and spread in a concentric circle.Pour few drops of oil and let it cook for a minute or so or until it starts browning. 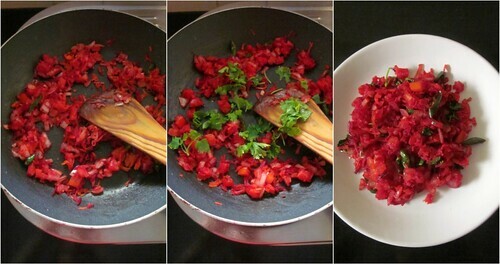 Spread the vegetable masala on the dosa with a spoon and place the potato masala on top. You could add grated coconut or chopped cashewnuts with the masala for an extra punch. The dosa is tasty on its own and can be had without chutney or sambhar on the side which makes it a meal[in this case,breakfast] by itself.Both the masalas can be made ahead and refrigerated. *I do not claim this one to be an authentic dosa as I got the recipe from Vanitha which featured dosa recipes from the famous Pai's Thattu kada in Ernakulam. Anything colourful catches the attention of kids and I have heard many of my friends claiming that the lunch boxes come back licked clean if there is variety.What better way than to pep up the lunch box with this colourful dosa?Sending this to Radhika of Tickling Palates for the Let's cook series which features Break-time snacks. 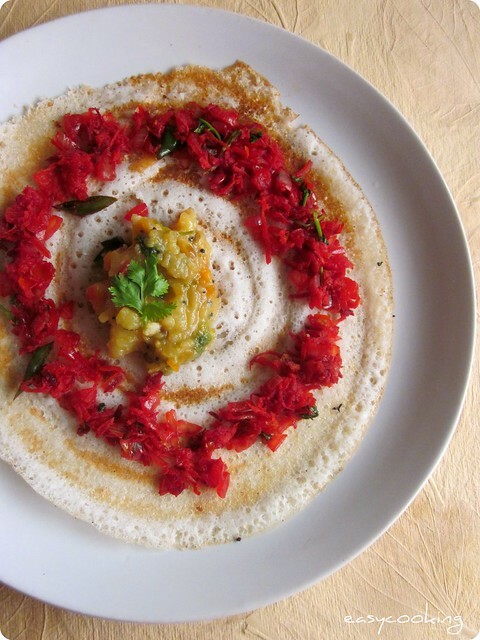 Also to Divya,who blogs at Dil-se for the Show me your... series which features the humble dosa this month. Delicious n mouthwatering....looks really yum.....very colorful dosa..
wow i hv never heard abt kanchi masala dosa hv only heard abt kanchi idly this is a must try n awesome dosa.. 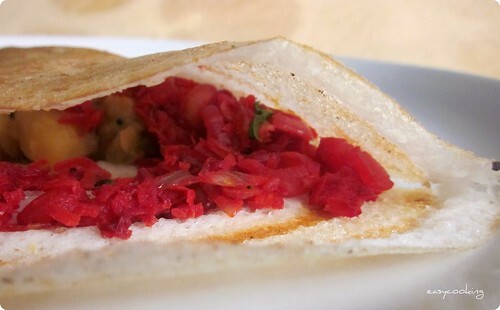 Stunning and super crispy masala dosa, just drooling rite now here..
Only heard of its namesake in idli..But as a dosa this is new for me..I infact just have a stock of some beetroots and it is time of the week when dosa needs to make an appearance on our breakfast menu.. ! Thanks..!! Dosa batter in the fridge is a real life saver, makes me lazy too! 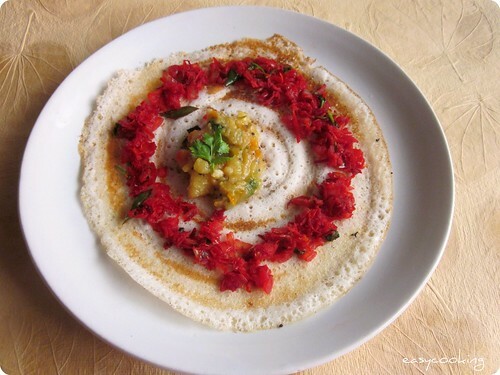 Haven't heard of Kanchipuram masala dosa, though heard of the idlis.. looks colorful and yumm!! When i was living at home we indeed had twice a week dosa and sometimes mom made masala dosa on sunday as we kids could enjoy the breakfast than rushing to get to the school. This looks so so good and your dosa look perfect. Colourful riot :) Loved the clicks. Looks so delicious and colourful. Very innovative. Love the colors on dosa! I hear you on the maavu mill! 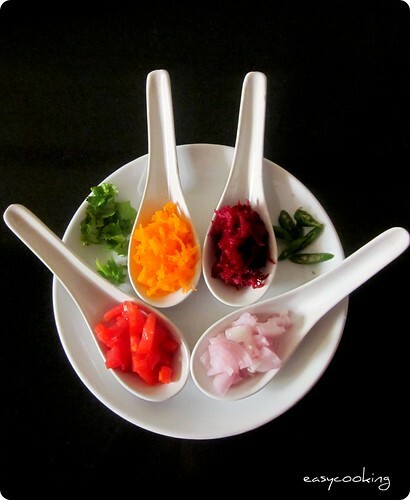 Dosa filling looks excellent and a neat idea - love this and you bet I'm going to try it soon. Thanks for this wonderful recipe. Tried this today n came out really well, like the hotel dosas..wow is the word. I ate dis dosha from Pai'dosha restaurant ernakulam. And i loved it. Was searching d receipie in google and find out yours, thanks divya for posting.